Summer is the perfect time to take a step back, relax, and take in the sunshine. 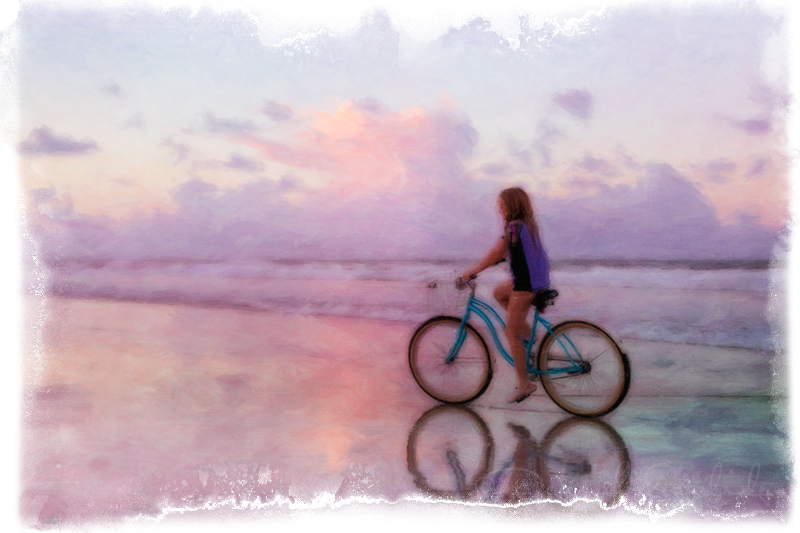 This little girl was riding her bike along the shore, what a great way to spend the evening! I couldn't resist working a few creative ideas to enhance the image. Tifffen Diffusion was added to take away some of the detail and soften the color. Next two layers of Flypaper Summer Painterly Ice Rose layers were added with a blend mode of Soft Light. A really cool edge treatment from OnOne Photoframes pulls the image together as an art piece for fun. This is more the vision I had when I saw the little girl riding her bike. I hope everyone is enjoying their summer too! I am trying to get in a little more beach time, just like this little girl, I loved the beach when I was little. Try Tiffen Dfx for the soft diffused look with icy colors, save 10% single items with promo code DEBDFX, visit the Tiffen Site here. Try Flypaper Textures Icy Rose for the sheer paper water color brushed look, promo code DEBS and save 15% on beautiful textures for your photos.